Have you been injured in an accident while riding a bicycle? Bicycle accident attorney Chris Olsen helps San Diego, CA, clients determine whether they are due compensation from liable parties. Bicycle accidents often occur due to dangerous road conditions and motorists' failure to see and properly yield to bicyclists. This type of accident can cause serious personal injury, including broken bones, soft-tissue injury, traumatic brain injury, spinal injury, and more. Chris Olsen will handle your case while you concentrate on recovery. Contact our office today to discuss your case and learn more. A single-person accident in which a bicyclist is injured without the involvement of a motor vehicle or other party: In this case, a bicyclist may fall because of potholes, unmarked bicycle lanes, roadway construction, or equipment. The Department of Public Works, California Department of Transportation, or another party may be liable for a client's injuries. 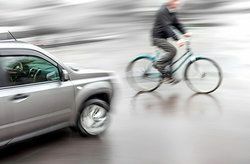 A collision involving a bicyclist running into an open door: This is one of the most common causes of bicyclist injury. When a car or other motor vehicle's door opens, bicyclists may not have sufficient time to avoid a collision. The owner of the motor vehicle or their insurance company may be liable for a client's injuries in this type of case. A collision in which a vehicle sideswipes a bicyclist while driving alongside him or her: This type of accident can cause direct injury from the impact of the vehicle and trauma as the rider is caused to veer off of their intended path which can potentially lead to a crash. A head-on collision: This type of accident commonly occurs at intersections, when a motorist fails to identify a bicyclist in a crosswalk, or when a motorist is making a turn without yielding to a crossing bicyclist. These types of collisions can be especially serious and even life-threatening. Each of these situations can lead to the need for costly, long-term medical care and rehabilitation. Chris Olsen will carefully reconstruct the circumstances of your bicycle accident and determine negligent parties that might have contributed to its occurrence. It is important to remember that some of your injuries may take days, weeks, or even months to present symptoms. There are several steps you should take to carefully document your injuries following an accident. If you have been injured in a bicycle accident, the first and most important measure is to receive medical attention. If you are not taken to the hospital after your accident, you will need to schedule an appointment for a complete physical as soon as possible. You should carefully document each of your medical appointments, taking note of your doctors' and other medical providers' names and the care that you receive. Time is of the essence to successfully reconstruct your accident and gather timely information about its specifics. Once you have discussed the incident with Chris Olsen, he will handle the legal processes involved in your case while you concentrate on beginning to heal. If you have been injured in a bicycle accident, contact Chris Olsen today to learn more about protecting your rights.